Hooks Heroes slot machine from NetEnt is a cartoon pirate themed game that is exceptionally fun in terms of both graphics and play-ability. The mobile slot has 5 reels, 20 paylines, and a max jackpot of 900x per line. The main appeal of the game is that is has an incredible three bonus rounds, one of which is a free spins bonus awarding between 7 and 15 free spins and a 4x multiplier for enhancing the prize. For all the details, check out the Hooks Heroes slot review below. For a cute and colourful video slot experience, look no further than NetEnt slots’ Hooks Heroes slot; a five-reel, 20 payline title that features a trio of unique free spins modes to boost your base game wins. 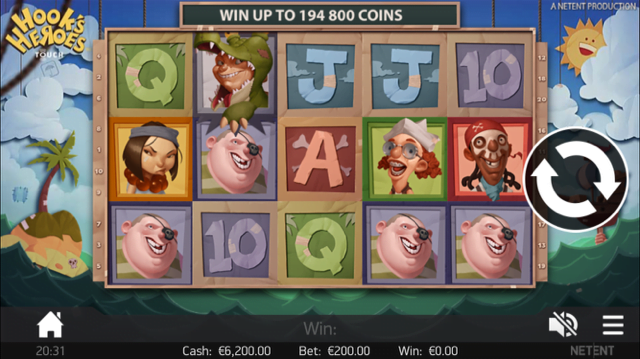 Featuring cartoon-style graphics that depict a range of young pirates, a wooden backdrop that has all the trappings of a school play and a Caribbean-style soundtrack, the Hooks Heroes slot machine provides a unique and engaging atmosphere to players that is further enhanced by a selection of entertaining animations. Playable for as little as £0.20 per spin across all desktop, mobile and tablet devices, the main selling point of the game is a trio of free spins features that are activated whenever two scatter symbols appear. With this rewarding a single free spin with a random modifier, should mobile casino players land three scatter symbols at once they’ll get to actively choose their modifier and receive 7-15 bonus games. The scatter symbol in question is a young boy sporting a crocodile’s head and this can activate one of three bonuses. First up, there’s the Fairy Feature which adds between two and five overlay wilds to the reels for your next spin. Secondly, there’s the Mermaid Feature which multiplies the value of all regular wins by 2x and the value of all wins containing a substitute wild by 4x for even bigger prizes. Finally, there’s the Pirate Feature which plays a little differently from regular spins. When this modifier is activated, the game’s 20 paylines will be removed and players will instead receive payouts whenever three or more matching symbols appear anywhere on the reels. This obviously makes wins far easier to come by, but the trade-off is that all wilds are removed during this feature. Although these bonuses are normally awarded at random, should players land three or more scatter symbols they’ll get to choose their favourite one going forward, with the Fairy Feature awarding seven free spins, the Mermaid Feature providing 10 and the Pirate Feature handing out 15 in total. Another visually stunning title from NetEnt, Hooks Heroes slot provides a fresh spin on the tried and tested pirate theme that further benefits from a selection of awesome free spins features. Like the Hooks Heroes slot review? Check out these as well…..